Booking direct has benefits for both the guest and the hotel. Unfortunately, there is still widespread reliance on online travel agents (OTAs), with 50% of European online bookings going through Booking.com. OTAs have typically been painted as the thorn in the hotelier’s side, having negative impacts on the revenue due to high commission rates. But hoteliers can also use OTAs to their advantage. OTAs offer hotels resources and marketing budgets that far exceed their capabilities. In order to compete in the ever crowded market, appearing on these OTAs is an integral part of a hotel’s discovery marketing phase. In 20% of direct bookings, the user has seen a hotel first on an OTA, so it’s important for hoteliers to put measures in place to help drive users back to their site in order to increase direct bookings. What are the benefits of booking direct? Profit – The hotel does not lose out on the high commission rates that OTAs charge. Personalisation – Booking direct provides the hotel with more data about the user, which they can use to personalise the guest’s stay and create the best possible customer experience. Communication – Unlike the booking process through an OTA, booking direct means there are no barriers in communication between the hotel and the guest. Choice – Guests booking through OTAs are not always the target market of the hotel. They are booking because they have found a deal rather than because they are invested in the brand. This could mean that the hotel receives fewer positive reviews, as its offering is not fully aligned with that particular audience. Flexibility – Typically, when booking direct, there is more flexibility if guests need to cancel or rearrange their stay, which will lead to a more positive experience with the brand. Luckily, the behaviours of internet users seems to be changing in a way that could support hoteliers’ efforts to bring users back to their sites. Millennials like to do their research, and typically they will browse OTAs to narrow down their selection and then research their shortlist on each hotel’s website. But how can hoteliers increase the chances of users booking direct once they land on their site? What can be done to compete with OTAs? If guests are researching the hotel, the website needs to be informative, engaging and easy to use. It also needs to be mobile optimised, as many OTAs are bringing out apps which make it easier to book on mobile. If possible, offer a best rate guaranteed, matching the OTA room rate or offering some discount on rooms. 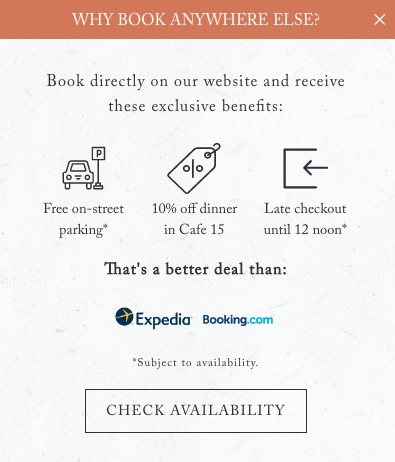 Additional benefits could also be offered, such as 10% off in the restaurant. This will also help to generate revenue once the guest is on-site. OTAs often bid on brand terms, and so it is important for the hotel to have strong PPC activity to ensure that when users return to book, their website is clearly visible in search results. People are lazy and will often click on the first link, so appearing at the top of the search list, above OTAs, can have a strong impact on results. Metasearch can give hoteliers the chance to promote their rates on search engines, aggregators and OTAs. 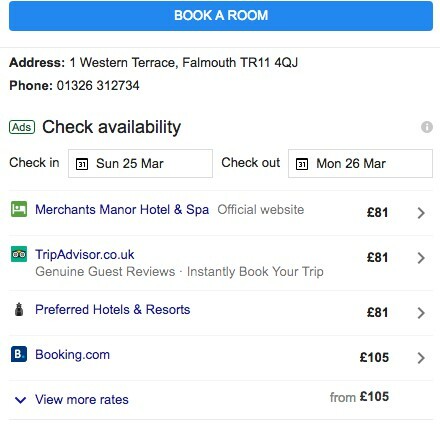 This means that book direct prices are shown in comparison to OTAs and, as long as there is parity between rates, will encourage users to book direct. To find out more about how paid search, metasearch, and website optimisation could help drive direct bookings at your hotel, please get in touch through through our enquiry form or call our office on 01242 801849.